Shot of a spider on my front porch. I occasionally get to watch him catch something and eat it, but today he was just hanging around. Canon T2i, HOYA Macro filters stacked to equal +7, shot on auto setting. Post edited in lightroom. Monarch Butterfly Caterpillar, feeding on a milkweed plant, which is normally toxic. However, the Monarch is able to use the toxins from the milkweed to protect itself from vertebrate predators like birds, and the bright coloration of both the caterpillar and butterfly life stages warns birds to leave them alone. As if that were not interesting enough, Monarch Butterflies migrate to Mexico, where they overwinter together in specific groves of trees. higher shutter speed for a sharp image. took a picture of the Beetle which came out no where near as good. I went off to the nearby "butterfly garden" (Hort Park, Singapore), but it turned out that it opens once a month and I was left staring at a glass cage. So I went around the park and this was one of my first shots. I wonder what the dragonfly is hiding from us! Shot with a T2i/100mm macro/F4.0/ SS -1/100 with lighting assisted by the setting sun. I shot this with my Canon T3i + 18-55mm kit lens @ f/6.7, 1/125, ISO 100. I took this shot on a mini vacation to Vermont. My girlfriend and I were at one of the local vineyards and I was trying to get a shot of some grapes. I just happened to see some bug on bug action and had to snap this pic. I took this photo at my friends house near the pond in his backyard. I laid in the grass for about 10 minutes waiting for these Blue Dragonflies to fly into range. It was surprisingly not turned off by the sound of the shutter and let me take several photos before flying away for more important dragonfly business. Canon EOS 60D, Canon EF-S 60mm f/2.8 USM Macro, Exposure time: 1/125 sec., F-stop: f/3.5, ISO: 100. I ended up spending the weekend at my parent's home and spent a while walking around with the dog looking for bugs. I ended up finding this bee completely motionless and took my chance. After taking quite a few photos with different settings, I had rather assumed the thing was just dead. This photo is from one of the last attempts I made before it proved me wrong and went buzzing off. I used a Canon T2i with the kit lens at 55mm and some cheapo extension tubes. I shot with just natural light in the early morning and did some minor color adjustments with picasa. Fun time out with the wife. Dragonfly at the Florida Botanical Gardens. Shooting insects is one of my biggest hobbies. I set out to get a photograph of a dragonfly but ran across a grasshopper. It isn't everyday that you see a grasshopper scratching his head with this kind of detail! Although the dragonfly photograph I got was a better photograph technically, this photograph is the one I choose to submit because of subject matter. I've lived in Okinawa, Japan for about 7 years but I'm original from the UK. We don't have too many interesting bugs in the UK. But they are plentiful and fearsome in Okinawa! When I decided to try & enter something for this challenge I went out to a local park to walk the dog early Friday evening, it was a frustrating time to get any pics because wind was blowing & the branches moving about too much. So I didn't get anything worthwhile. I was about to leave & was reviewing what I had taken, when I suddenly spotted this praying mantis resting on a dragon fruit growing at the side of the road. It was a stretch to reach the camera over the fence & I had to take the pic upside down, but just as I did he snapped his head around & looked directly at the lens! I also spent a few hours on Sunday taking more pics, actually some good ones of the Giant Okinawan wood spider, but as it turns out I think this one is best. Found this mantis hunting in the garden so I tried to get in close for a picture, unfortunately I had to hurry since it just started to rain. After a few shots I finally got this picture then it decided to fly onto me and start attacking my arm. Figures when I finally get it off me and back on the plants it decides to downpour and the mantis flies off into another bush. My bug photo submission is that of a lively cluster of ladybugs captured on a trail hike near Danville, CA. While walking my springer spaniel, Nikko, I noticed a reddish blob in my peripheral. I've never seen such a concentration of ladybugs! I carefully approached and tapped the focus on the group and snapped with my iPhone 4. No fancy camera, Instagram, Camera+ or anything else. After a rainstorm, I walked out in front of my house to take advantage of the soft ground and do some weeding. I found this little guy in the middle of my purple lantana bush. He was a bit shy at first. The only thing I used was my iPhone 4. I tapped to focus on the palm of my hand, then brought the lens up quickly shoot the mantis. I think it turned out well enough. Editing was performed with Snapseed on my iPad. After this contest was announced, I watched for bugs and one morning, this spider had wandered into the stainless dog dish. Trapped for the photo duration, the spider made an interesting study with light shining through its legs. The reflection in the dish shows the belly of the "bug" and the light/dark contrast in the dish illuminated colors I hadn't noticed in these spiders. The fires and resultant ashfall in Colorado ruined my other camera, and this Canon A1300 just arrived in time. Setting it to macro, I played with light and shadow and of course, placing the lens where the spider might be still enough and the light might be right, well, interesting. No spiders were harmed in this photo shoot. It was released into a wild rosebush. I am currently on a trip visiting some family in Seattle and there have been a lot of opportunities to take photos of bugs around the area especially in the country. I was in the town of La Connor saturday with my mom and sister when a wasp decided to land on my sister's foot. Unlike most girls, she stayed calm and let the wasp crawl on her foot while I was taking the shot. I named this picture Cold Blooded. I took the photo with a Canon 550D otherwise known as Rebel T2i and the 55-250 EF-S IS II lens. As I usually do for close-ups, I used the telephoto end of the lens and focused to the closest point manually. I was in Program mode with an exposure of -1 EV. The exposure time is 1/320 and the ISO is 400 at f/6,3. No major photo editing was involved, only a crop and a few colour adjustments. Here is my submission to your 2012 "Bugs" photo contest. I happened upon this female Wolf Spider ( Lycosidae ) and her egg sack while I was bagging some cut grass and flowers. I almost put my hand right on top of it! I went in and grabbed my camera and got this shot. Shot on: Canon 7D, Macro EF-S 60mm f/2.8 lens @ iso 200 f/4.5 1/40 sec. I have been wanting to submit to one of these contest for awhile, but never have the free time to get the shot. 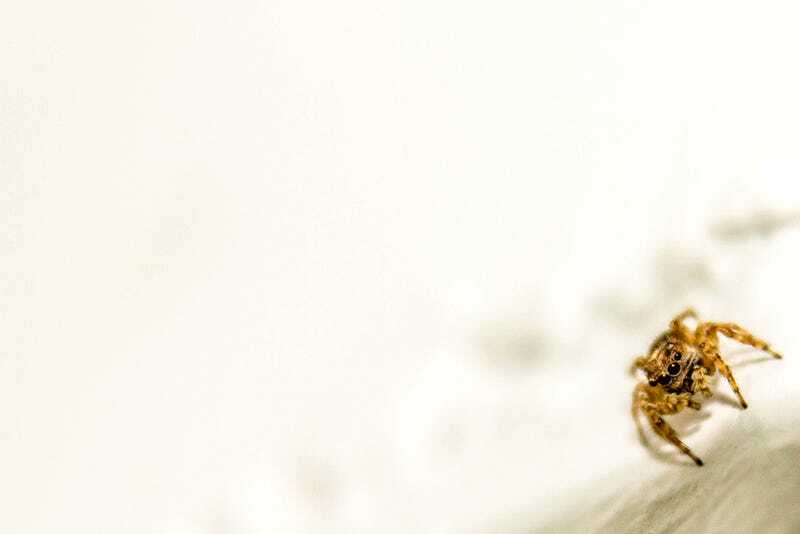 Last week I was taking some macro photography of a White Candy Strip spider eating a bee. Some great shots, but I was unable to submit due to the time window of the contest. This morning, I was out in the garage and I was disgusted how the window was coated with spider webs. In the top corner, I noticed this shot and quickly grabbed a camera. I love window light- I just have never shot a window illuminated shot of a bug before. I love the natural translucent look of the legs. Took it into lightroom and tried to bring up the shadows and detail of the shot. A hot and humid morning, and all I could find to shoot that were remotely interesting were some quick moving flies. I choose this over a couple of really sharp straight forward shots. I like the abstract feel of it, the eye frozen in time while rest of the image has this whirling mass effect. I took this shot quite a while ago, almost a year now. My friend and I were wandering through his neighborhood, when we chanced upon this little guy sitting on a tree. For some reason, no ma matter how close we got, he didn't move. This led us to believe he was dead, but also to a great shot. Surprisingly, an hour later, when we returned to that spot, he was still there, confirming our suspicions. This beady eyed fellow was quite the shutterbug. Shot with a Canon 7D at 1/100 sec at f/6.3, ISO 100 with Canon EF100mm f/2.8L Macro IS USM Lens. My girlfriend happened to notice this cicada coming out of it's shell so I whipped out my iPhone 4 started snapping. I used my macro lens and a flashlight because there was very little light. I'm still not very happy with the low light and graininess but I had no choice. I only did minor adjustments in photoshop. Slight cropping, contrast and vibrance/saturation. Our morning walk through the park did not yield any Herons, Cranes or Deer. Today it was a mythical beast (tiny version) the Dragonfly. Perched majestically atop a reed waiting to strike. I'm no photographer, but happened to have a friend's Canon EOS Rebel XS with it's plain ol' 55mm lens. I took this shot with the Night Mode after a few unsuccessful shots without flash. Cropped the picture and saturated the colour slightly in Photoshop. Feeding time for my Crested Geckos, and sometimes the crickets get real brave before they get snacked up. I am a dragonfly fanatic. Every evening or afternoon I go outside hunting dragonflies with my macro lens. More often than not, I don't find a dragonfly. Instead I wind up shooting a wasp or a spider or a robber fly. But today I got lucky with this beautiful dragonfly. He wouldn't let me get too close. I kept creeping up and he kept flying shyly away. But I was able to get within a few feet of him for this shot. I try very hard to focus on the eyes and the head because dragonfly eyes are so fascinating. This shot focuses not only on his head but also part of his intricate back and wings. Found this bugger trying to fly out of Lake Nipissing on the beach in North Bay, Ontario yesterday. came straight out of Trout Lake after the devastating formaldehyde spill that happened last month. taken right before I took my first bite. Om nom nom. For this shot I used a Nikon D50 with a 50mm at f3.2 1/60s. I also used a screw on Marumi Macro +5 filter, which is fun for doing macro shots but makes the depth of field impossibly narrow. There is this odd cicada connection in my family. My sister and I used to love cicada summers and would go hunting for molted exoskeletons when we were kids. Now that I'm married, it turns out that my wife and her Mom also love the buggers, so much so that for my mother-in-law's birthday, the big gift was a custom made cicada brooch. My wife happened to spot this one in the driveway this weekend, and I've never seen one mid-molt before, so I thought it'd be cool to share. In search of bugs to take pictures of, I came up surprisingly empty-handed until I stumbled across this: the bug equivalent of an old, broken down car left on the side of the road. Dusty, covered in spider webs, but otherwise undisturbed, it got me thinking about the previous owner and how nice it must of been to shed himself of the tough skin life had given and start over fresh with a new face. Last night we went walking around the Air Force Memorial, there were these huge bugs flying all around us and unfortunately I did not have my macro lens on me but, my 50mm did the job. I shot this with my Canon T3i. I've been looking at the shooting challenges for years thinking how badly I want to do it, I just recently purchased a DSLR and this is my first crack at it. I was hiking to Titus Lake in Sun Valley, Idaho while on vacation this weekend with the gf and thought what better place to find bugs. I wanted to capture a bee diving into these blue flowers to show the yellow/black/blue contrast, but just couldn't find any in these flowers. I did find this little guy (who I thought was some sort of black bee) who turned out to be a beautiful shiny blue color. Shot with a Canon T2i, with the 18-55 mm kit lens, with a dirt cheap 20 dollar macro lens screw on from amazon, a little post processing done in Aperature. I Was outside in my garden to take a photo of my apple tree. In one of the flowers i saw this bumblebee sittin' and "doin his thing" , I took a shot and it turned out to be great despite my poor equipment. I used my 2009 HTC Hero Smartphone, 5mp camera with default settings.